All the worlds Cognacs wish they were Remy Martins gift box Fine Champagne Cognac VSOP and all the worlds drinkers wish they were drinking it, it has the palate of apricot, peach and hazelnut combined with vanilla and rose aromas. Dominant notes of vanilla thanks to longer aging in French Limousin oak barrels, followed by ripe apricot, baked apple, and an elegant floral. A perfect harmoheny between the firm character of ripe fruit and subtle notes of liquorice, offering a great complexity of elegant and powerful aromas. Well-balanced, structured, and multi-layered. The roundness and fruity notes are enhanced by a one-year finishing period in small oak casks of over 20 years of age. Rémy Martin VSOP Mature Cask Finish is extremely versatile, so you may enjoy it neat, on the rocks, frozen, or in cocktails. 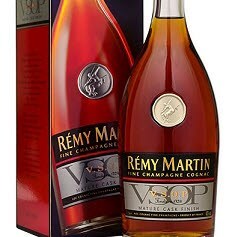 We recommend drinking Rémy Martin VSOP Mature Cask Finish with ginger ale or in a classic cocktail such as the Brandy Crusta or the French Mojito.